The CAS program consists of ten courses, including at least one colloquium or seminar and one directed reading course. In general, students construct their own curriculum (either general or specialized), in consultation with their advisor, as long as the curriculum falls within the program guidelines specified here and does not duplicate previous graduate work. An intensive directed-reading course called TH790 CAS Directed Reading is the capstone experience of the program. The student is guided by a member of the faculty on a topic approved by the Dean. The course consists of guided reading (approximately 1,500-2,000 pages) on the topic together with three critical reviews and a final paper analyzing and synthesizing the materials in the readings. (Note: Tuition for this course is at independent-study rates, 50% higher than regular tuition.) There is no thesis option or comprehensive exam in the CAS program. Students in the general track may take up to two approved independent-study courses and any number of approved seminars and colloquia in lieu of the 700-level general course offerings, as long as two of their total courses are in one department. 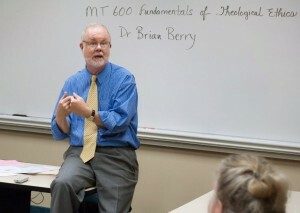 Students in the general track may take up to six credits in a biblical language at the 600 level.